You wouldn't believe how busy I am, even though I'm enjoying a well-deserved holliday! I won't bother you with all of the things I'm going to do or have done already, but I have less free time than I expected. That's why I am blogging a lot less regulary lately. Excuse-moi, genuinely! Quickly hit the 'more strawberrytea' button for the reviews! Topvintage is a site where they sell all kind of unique vintage items. The site is well organized and they sell clothes, shoes, soap, jewellery and all kind of other accessories! Moreover, they offer a wide assortment! The webshop gave us a owl-necklace, a beautiful ring, little soapie and a voucher. More than enough reason to thank them! 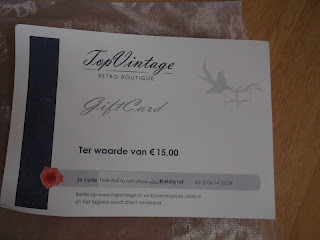 The voucher, 15 euro's, so generous! You should click on it to see the discount code moehahha. They gave us the automatic eye pencil in the colour 20 olive green. Beautiful! The eye pencil promises to be long lasting and waterproof. Most of the eye pencils I have had are neither of those, so I was very curious! This is the swatch, after just applying it very lightly. Look at that pigment, stunning! Applying the eyepencil is easy because it works accurately and smoothly and gives off a lot of pigment quickly. The only disadvantage is that the eyepencil might be slightly too soft, because a tiny piece broke of while applying (not while swatching)! And it did last long, wow! Butttt... Is it waterproof, too? I wet my hand for half a minute or something and look! It is slightly less dark but it still lasts! Well done blézi! SoapZ.nl is a webshop which sells áll kind of soaps. They're all (hand)made in a way which is ecologically accountable! Moreover, they use oliveoil in the soap I received, which means your hands won't get dehydrated of using it. Great! I received JewelZ- Earth. It consits in a serie in which you also have Water, Fire and Air. How creative! It is a soapie with a citrus-like scent. Personally I think it's not the best soap I have ever smelled, but it's good though. After washing your hands with this soap they feel clean and soft, which is a good thing! Okay, I'm going to be honest with you: I have only tested the lipbalm, because I ran out of time. But I hope you will still enjoy my opinion about the lipbalm! Rebrocosmetics is a wholesale business (had to look up that word haha) which is focused on all kinds of beautybrands with all kind of different beauty products. Like that. Unfortunately there happened a disaster: their companybuilding burned down so they're not able to process an order untill the 23rd of July. They sponsered us by giving us a Fanta lipsmacker! I love Fanta so there it's unnecessary to tell you how incredibily excited I was about that! For the people who want to have more information. Oh my, this lipsmacker smells ánd tastes like Fanta, mind=blown! It was like I was just putting fanta on my lips which was pretty strange haha. I am so glad Rebrocosmetics decided to send us this lipsmacker because I am in loove with it! Sfeerzeepjes.nl is specialized in the cutest soapies on earth! They send us a pink cupcake-soap with cinnamon-scent. It smells so gooood haha. After washing your hands with it (it feels like a crime to use it, so I used the underside) it first looks pink and then becomes white. Lovely! The scent remains for a few hours and my hands feel soft and hydrated. Entrancing! If you go to silkyroses.nl you're flabbergasted immediately because of the incredibile-looking lay-out. All vintage, I love it! Look how the letter looks! Every vintagelover feels how her heart melts while seeing this letter! They gave us the Paris Memories Lipstick which changes to the colour that suits your skin colour best! On every skin it will turn out differentely! The lipstick does not look very attractive because of its blackness. The swatches however, are a whole different story! It's quite longlastig, too! What else do you want? And sorry for le horrible me. Dehipstedingen.nl is a webshop with a very wide assortment of nailvarnish, jewellery, accessories and covers for your phone. Lovely! Dehipstedingen gave us a lipbalm, a chocolate and a ring. The cream of the story... This ring. Look at it, perfection over there. I was always craving for a bow-ring, and now I have it! 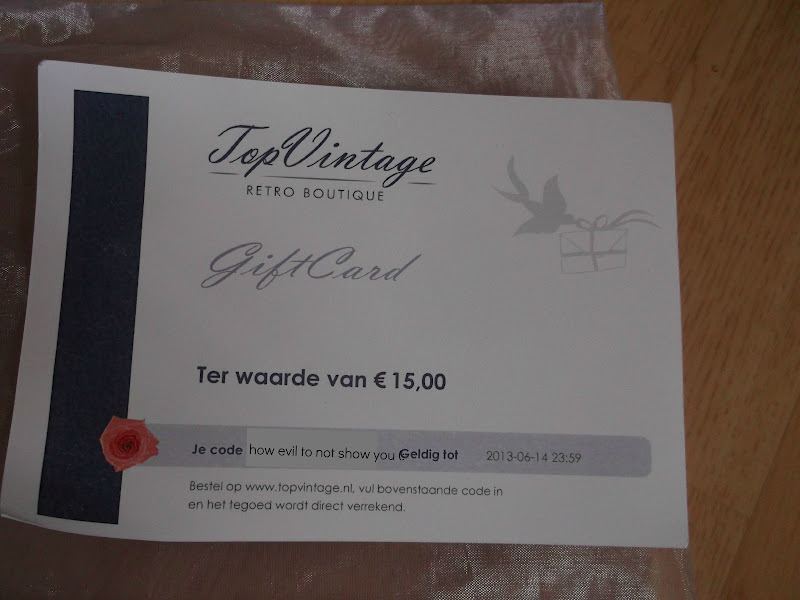 Thank you so much Dehipstedingen! Those were the reviews! I hope you enjoyed it! It was a lót of work, haha. Jaaaaaaaaaaaaj, ik kan het weer lezen! Thank you girl! :) De goodiebag was damn nice gevuld, ik vond het stuk zeep er zo leuk uitzien. :) De ring is trouwens ook echt amazzziiing. Wat een geweldige goodiebags! Leuk joh! En hoezo 'le horrible me', je staat juist leuk op die foto! PS: Join my winparty! 8 giveaways with awesome items! Wauw lekker veel spulletjes! Die lippenstift die zich aanpast aan jouw huidskleur is tof! Leuke spulletjes allemaal. Die ring is echt geweldig. Ik ben benieuwd naar je reviews! Er zitten alleszins leuke spullen tussen! Wauw wat een gave goodiebag, echt hele leuke dingen! Oh die lipstick werkt echt! en wat een lief berichtje, soms vraag ik me af of mensen het überhaupt wel lezen, leuk om te horen dat het wel zo is! &Hmm ik ben echt een ramp in headers maken, ik wilde zelf ook een keertje zo'n actie doen, sorry! Wow super veel producten, maar wel echt super leuke producten! En die lipstick van Paris Memories lijkt me heel tof, ben benieuwd welke kleur die bij mij zou worden!